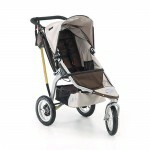 The BOB Revolution 12 AW Stroller in Coffee /Chocolate has all the features you want all in one stroller! Is has all the maneuverability and versatility of the Revolution stroller kicked up a notch. Designed with 12 front wheel that swivels can be locked forward for maximum stability for running or jogging and straight-ahead walking. Smaller wheels enable increased mobility in crowded aisles and cramped elevators. The lightest of the Revolution strollers, its just as easy to fold up for travel and storage. The BOB Revolution 12 AW Stroller in Coffee /Chocolate is equipped with rear wheel foot-activated parking brake which is easy to operate and locks out both rear wheels. The BOB Revolution 12 AW Stroller will be with you for years to come! I love this stroller…so great to zip around town or stroll the neighborhood…on and off road! So easy to store and it’s light. The storage compartment is great for all your needs…diapers, blankets, sippy cup, toys…and I highly reccomend the cup holder w/ zip pouch accessory…HIGHLY recommend! This is the best stroller. it is easy to carry, and fold up. plus it is very easy to push while running and walking. My little girl love to ride in it too! I love the smooth ride of this stroller, it can go over curbs, on gravel, etc. It is a little difficult for me to fold up and put in the trunk, and in general is a little bulky. But if you like to walk on trails, these tires are necessary.